Last night I finally got to scratch an itch that I’ve had since April 5th, 2008! That’s the night that we first saw Sweet Bitters live. I covered that show in this post, but as you can see, in the comments, Sharon suggested that I check out Red Molly. The minute I heard their stuff (you can hit the Play button on the top right of their site) I knew I would love their show. We had a failed attempt to see them that month (as I noted in the comments), and since then, I’ve actively searched for opportunities, but scheduling kept conspiring against us. Until last night, finally! As a bonus, another group that I’m pretty sure I heard about through Sweet Bitters (but I wouldn’t swear to it), The Nields, were opening for Red Molly. Red Molly were awesome, in every respect. They opened the show with an a capella number, showing off their amazing voices, individually, and collectively (in glorious harmonies). They also closed the show with an a cappella encore, again, sending shivers down our spines. 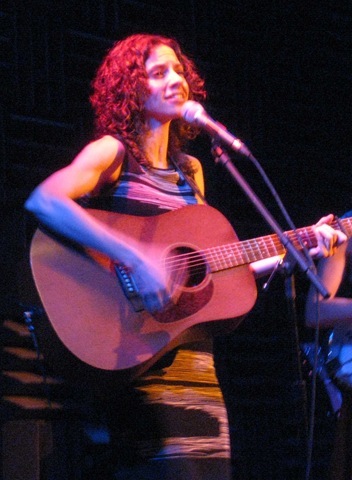 Abbie Gardner sings, plays dobro and acoustic guitar. She sings like an angel, usually taking the highest part in the harmonies, but she sang quite a bit of lead as well. 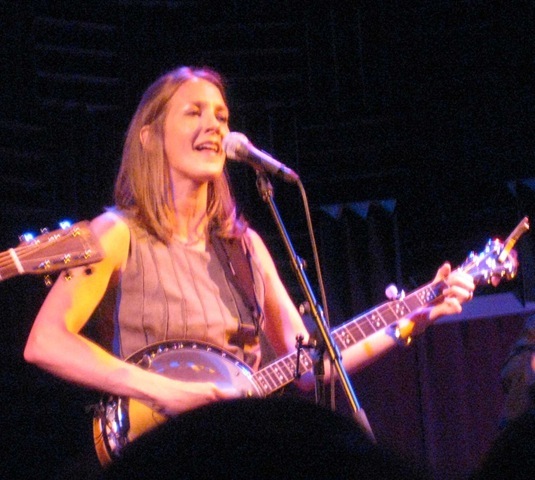 She’s an excellent dobro player (no one is in Jerry Douglas’ league, so don’t ask!). She plays the guitar well too. She also wrote at least one of the songs they played last night (Red Molly does more covers than originals), and it was excellent. Abbie was also very funny and engaging on the stage. 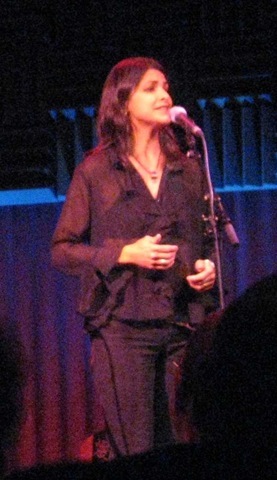 Laurie MacAllister sang, played the banjo, acoustic guitar, and acoustic bass. 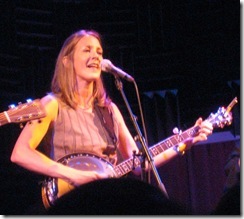 Laurie has an incredible voice, plays the banjo, guitar and bass well. I’d never seen this style of acoustic bass before. It looks exactly like a normal guitar, but it only has four strings, and sounds like an upright bass. Carolann Solebello sang, played the acoustic guitar and acoustic bass. 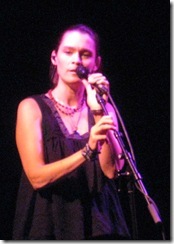 Carol also has an incredible voice, carrying the lower range for the group. She’s also a talented guitar player, and handled the bass with aplomb as well. Of the three, Carolann is probably a little more animated on stage, but all three are extremely warm. The Nields are two sisters, Nerissa and Katryna. 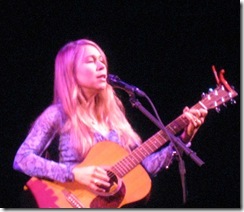 Nerissa sings and plays the acoustic guitar. Katryna sings. Both have lovely voices, and they sing beautifully together. Nerissa plays the guitar well, and accompaniment and arrangements are traditional folk style (like Peter, Paul and Mary, etc. ), which is one of my all-time favorite genres. They are both very warm and engaging with the audience. Katryna told a very long story (very well), and Nerissa took over at the end to make some corrections (remember, they’re sisters!) 😉 and it was funny and worth the break from the music (not that any break would be necessary when these two are on stage!). We bought their CD too after the show, and Lois got both of them to sign it. 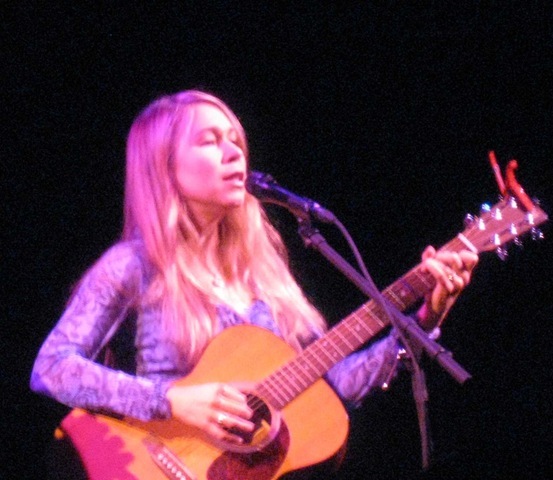 I’m in the process of loading both the Red Molly and The Nields CDs onto my iPod as I type this, and we look forward to many listens in the months to come. 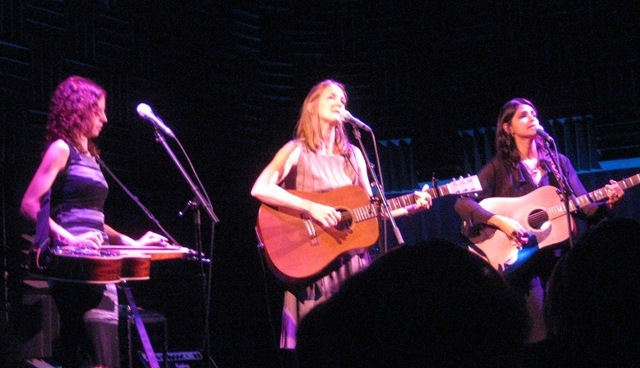 Thanks to both Red Molly and The Nields for exceeding our very big expectations after such a long wait to finally get to see them perform live!